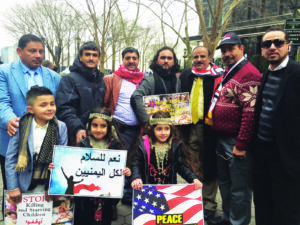 NEW YORK CITY — On a cold, snowy Sunday morning, more than 100 Arab Americans gathered outside the United Nations headquarters to protest the United States’ support for Saudi Arabia, which they say is the culprit responsible for extreme devastation and famine in Yemen. Dozens of Yemeni, Lebanese and Iraqi American demonstrators met at a Dearborn mosque on Saturday evening, before embarking on the trip to New York City. 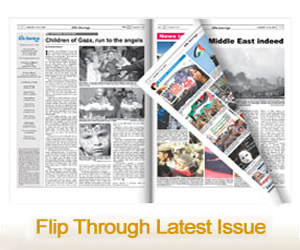 There, they held banners and signs depicting malnourished Yemeni children and destroyed buildings and historical sites. The diverse crowd demanded that the U.S. cease military aid to Saudi Arabia, which has continuously bombed Yemen for two years. But most importantly, they want to launch a grassroots campaign to raise awareness among the American people about the crisis in their homeland. It coincided with a massive demonstration on the same day, in which more than 100,000 Yemenis packed a square in the capital Sanaa on the second anniversary of a war that has claimed the lives of more than 10,000 people and pushed the country to severe poverty. It was the biggest gathering since a Saudi-led coalition entered the conflict in 2015 to try to restore President Abd-Rabbu Mansour Hadi to power after he was ousted from Sanaa by the Iran-aligned Houthis. In Yemen, children are paying the highest price, as 2.2 million are malnourished, four-fifths need humanitarian aid and up to 1,600 schools are shut down or destroyed. 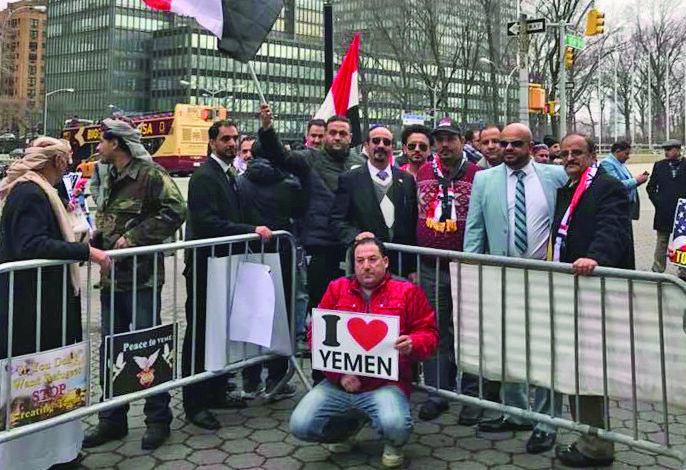 Yemeni Americans protesting in front of the U.N. headquarters in New York City. Walid Fidama, a local Yemeni American activist, was one of the Metro Detroiters who took to the streets in New York City. He said a few onlookers became sympathetic to the cause and joined them, but that most people worldwide, including heads of Arab counties, are oblivious, apathetic or have certain stakes in the war in Yemen. He urged U.S. officials to “show humility”, affirm the country stands with human rights and justice and reassess their relationship with a country that imposes adverse ethics and limited freedoms on Saudi nationals. Yet, Fidama has some hope that the military coalition leader could eventually be held accountable by the U.N. Security Council in the midst of Saudi government crackdown on corruption and spending by members of the Saudi Royal family. “But when they have billions of dollars and are still signing the checks, I don’t think it’s going to be very soon,” he said. Nabil Aljomai, a Yemeni American living in the Bronx, said police shut down demonstrators about an hour into the protest, despite many prior successful ones they’d organized. “People want to do something, but they can’t listen to us,” he said. He added that many Arab Americans are blinded by religious and national allegiance and are disconnected from the Yemeni strife. Yahia Almawari, a Dearborn-based activist and founder of American Action for Peace in Yemen, said in addition to protesting in New York City, he sent a resolution to every member of the U.N. Security Council and President Trump, calling for the establishment of an independent commission to investigate Saudi war crimes and prosecute them in the international criminal court. The Yemeni American also blasted the travel ban on Yemen and called for a lifting of the blockade of aid and the providing of emergency humanitarian assistance of food, medicine, baby milk formula, fuel and shelters. Almawari said many wish for an end of the diplomatic representation of the “exiled illegitimate Hadi government” backed by Saudi Arabia and for the Sanaa government to be represented by the people inside Yemen. Adel Almathail, whose family is trapped and suffering in Yemen, drove to New York City from Buffalo. He said that while the American public’s consciousness could be awakened if enough light is shed about the crisis, he believes there is little desire among Arab world leaders who operate to safeguard their interests and ideology. Jamal Mogalli, a retired Ford factory worker, said he braved the cold in front of the U.N. headquarters to honor his children, who serve in the U.S. Air Force, and America’s high regard for civil rights. He recalled the day he arrived in the U.S. in May 1971, the same month the U.S. and Yemen agreed to work together to bolster economic development in Yemen. As several humanitarian organizations strive to tackle the crisis in Yemen, Mogalli said he is optimistic about his home country’s recovery.